Dr. Arvind Kumar Chauhan is one of the top Laparoscopic Onco-surgeons in North India with close to 20 years of experience in advanced laparoscopic surgeries. 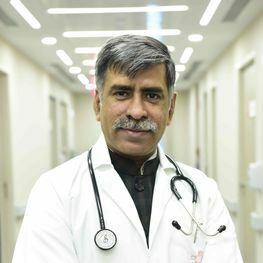 He has worked as an Advanced Laparoscopic and GI Surgeon at Dharmshila Cancer Institute and at PSRI (Pushpawati Singhania Research Institute). He is proficient in surgeries performed for liver, gall bladder, pancreatic, colo-rectal, uterine and ovarian cancers. He is an internationally recognized authority in Pelvic Laparoscopic surgeries and a visiting faculty at Tashkent, Uzbekistan and Astana, Kazakhstan. His focus areas include advanced laparoscopic surgery for hepato-biliary-pancreatic and pelvic (colo-rectal/uterus/ovary) pathologies.